More than a half a foot of fresh snow fell in EagleVail at the base of Beaver Creek overnight Sunday into Christmas Day on Monday (David O. Williams). 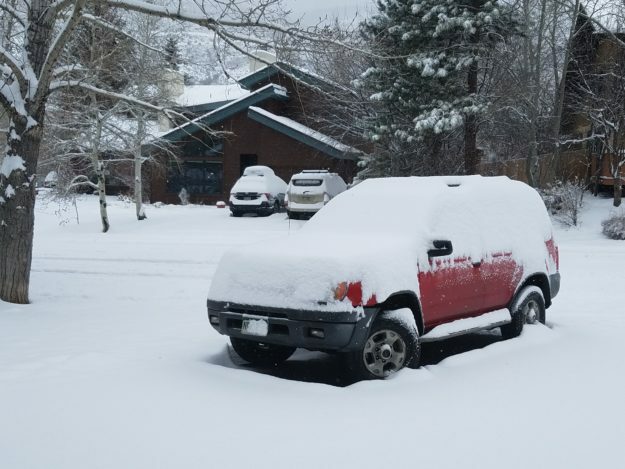 After nearly a foot of fresh snow late last week, another snowstorm delivered a Christmas gift of several more inches Sunday night into Monday morning, coating the Vail Valley and allowing Vail and Beaver Creek ski areas to open significantly more ski terrain and chairlifts. It’s a been one of the slowest starts to ski season in recent memory, but the latest snowstorms are allowing both resorts to play catch-up. Vail was set to open Game Creek Bowl on Christmas Day, and the new, six-passenger Chair 11 was set to debut on Tuesday, Dec. 26. After the most recent storm rolled out Monday afternoon, there isn’t much snow in the forecast for the next week, according to meteorologist Joel Gratz of Opensnow.com. “Most mountains in Colorado are reporting fresh snow on Monday morning,” Gratz wrote. “The northern mountains are leading the way with 10-12 inches as of 7 am and we should see another few inches through noon, then the snow will taper off. Ski Monday morning for the best pow! “The rest of 2017 will likely be dry. I can’t rule out some snow in the northern mountains this weekend, but I also can’t rule it in. I am hopeful that the stormy weather will return sometime between about January 3-6, 2018,” Gratz added. VAIL, Colo. – Dec. 24, 2017 – On Tuesday, December 26, Vail Mountain will debut Northwoods Express (#11) as a six passenger lift. Northwoods Express is the most recent lift upgrade on Vail Mountain and marks the 10th new chairlift in the last 11 years at the resort. By Tuesday, Vail Mountain will have 900 acres of terrain open for skiing and snowboarding. On Monday, December 25, Vail Mountain will open Game Creek Express Lift (#7) with additional terrain totaling 618 acres available for skiing and riding. In addition to the new Northwoods Express Lift (#11), Sourdough Express Lift (#14) will open on Tuesday, December 26. With the chairlift openings and additional accessible terrain, Vail Mountain will have 900 acres of terrain open on Tuesday. Two Elk will be open for dining beginning Tuesday, December 26. Northwoods Express (#11) is a primary lift on the front side of Vail Mountain, serving intermediate and advanced terrain. The new lift will reduce wait times and increase capacity by 25 percent. The increase will also improve the flow of skiers and snowboarders to the legendary Back Bowls and Blue Sky Basin throughout the day, as well as create a better flow of traffic exiting Blue Sky Basin and moving across the mountain at the end of the day. BEAVER CREEK, Colo. – Dec. 25, 2017 – With 6 inches of new snow in the past 24 hours, Beaver Creek is offering 481 acres of top-to-bottom skiing and snowboarding on beginner, intermediate and advanced terrain. With recent snow storms, the resort opened new terrain in Red Buffalo Park and Primrose trail, providing connectivity from Beaver Creek Village to Bachelor Gulch. VAIL, Colo. – Dec. 26, 2017 – With the help of recent snow storms, Vail Mountain and Beaver Creek Resort will open additional terrain on Wednesday, December 27. Beaver Creek Resort will open Rose Bowl Express Lift (#4) with access to Stone Creek Meadows. Yesterday, Vail Mountain debuted the new Northwoods Express Lift (#11), the 10th new chair lift in 11 years. All guests are reminded that they must observe all posted signs and closures, especially during the early-season. Closed trails may contain hazards due to early snow coverage. Accessing closed terrain is a violation of the Colorado Ski Safety Act and will result in the loss of skiing privileges and could involve prosecution and a fine.